There are many climate change deniers who say that volcanoes release as much or even more carbon dioxide (CO2) emissions than humans. And although volcanoes represent the mighty force of nature they are still very tiny CO2 polluters when compared with emissions resulting from human activity. According to the latest US Geological Survey humans release roughly 135 times more CO2 annually than volcanoes. What this means is that the human activity emits in under three days the amount that volcanoes release in an entire year. The scientists have come to this conclusion by making the compilation of the available estimates of CO2 emissions from all global volcanic activity on land and undersea and then comparing this data with the estimates for human emissions. 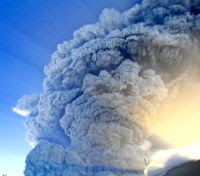 The scientists measured the level of CO2 emissions in volcanoes by remote sensing or flying through clouds of erupting volcanic gas, and by measuring certain isotope concentrations near undersea volcanoes. This latest study proves that the myth of volcanoes emitting more carbon emissions than humans is very far from the real world, lacking any scientific backing. Climate change deniers are actually using the image of the tremendous force of volcanoes and massive volcanic eruptions in order to try to convince the people that the enormous amount of CO2 are being emitted to the atmosphere. They seem to be forgetting that unlike volcanoes humans emit CO2 24-7 which results in massive global level of emissions. And since the volcanoes are the largest natural source of CO2 emissions in the world it is very unrealistic to accept the theory that the ongoing climate change is natural process. Man-made climate change is certainly more plausible explanation.